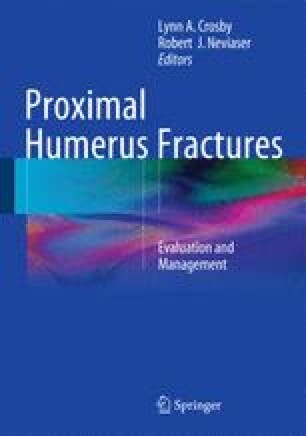 Displaced fractures involving the proximal humerus in the elderly population may be difficult to treat with standard methods available. Percutaneous pinning, Open Reduction, and Internal Fixation may not be sufficient secondary to the bone quality. Hemiarthroplasty in this age group has been only moderately successful mostly secondary to underlying rotator cuff problems or failure of the tuberosities to heal. Reverse Total Shoulder replacement has become a common treatment option in the elderly age group with either weakened bone quality or underlying rotator cuff dysfunction. Early outcome studies have revealed a better functional result and better pain relief than hemiarthroplasty in the elderly population with similar complication rates reported.